Healthy juice is a very powerful food. It is so important in improving as well as maintaining a healthy lifestyle. In 1999, when I rejected medical treatment for my cancer. You may have already read my story in "About Us". I decided to change my lifestyle to a whole food plant based diet that included large amounts of healthy juice. It made good sense to me after educating myself on the benefits of this lifestyle. I wanted my cancer cured and not just treated. So I chose food instead of relying on those who practice modern medicine. Since changing my diet, I have been studying plant-based nutrition and plant foods ever since adopting this new lifestyle. As a result, I have been able to sustain and enjoy good health. 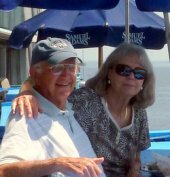 Good health, to me, is taking no medications at all...and, I'm not sure my recovery from cancer would have even been possible without the inclusion of the green barley juice powder. Barbara and I take this healthy green food every day along with other juices that I make five days of the week. We would not be without this wonderful life sustaining food. The action of sunlight on the green plants combined with carbon dioxide and water produces life sustaining foods as well as producing life giving oxygen as a by-product of photosynthesis. Today green products are mostly absent from family meals. We consume processed foods that are mostly food-like things that are calorie dense instead of nutrient dense. Manufactured foods are also devoid of most of the essential life giving elements that are found in whole plant foods and filled with elements that are toxic to your body. 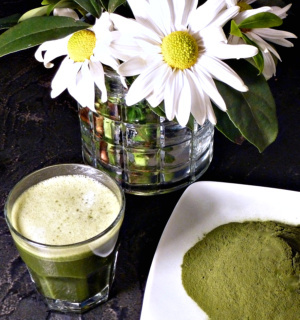 This wonderful green powder is a super alkaline food. The answer to our health problems...as Kermit the frog says, It's good to be green! When we learned that DISEASE LOVES AN ACID BODY, this is when we realized that we needed help in maintaining an alkaline one. It is so important to maintain a diet of enough vegetables and fruits, especially green vegetables. By taking a green healthy juice daily, for us, it was the way to go. 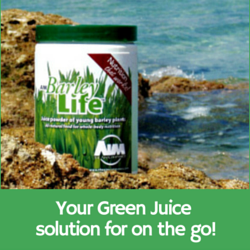 In our search for the best green product, we finally decided on AIM BarleyLife. 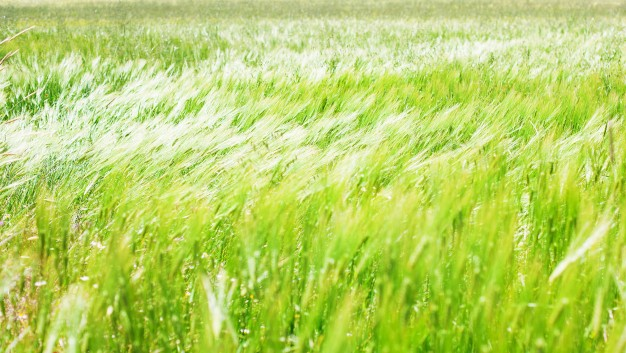 In our opinion, it is the purest, cleanest, beyond organic and the most potent green product we could find. This healthy juice product is made up of young green field grown barley grass that is harvested just before producing seeds, and is the most nutrient dense of the basic plant types. 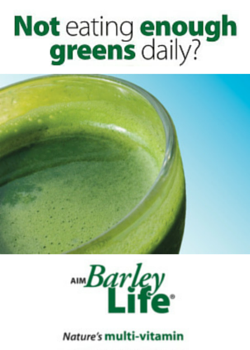 BarleyLife is also the most reasonably priced living green juice product available. Since 1999, we have enjoyed health and energy that we never experienced in our younger years. Sometimes, with the busy schedules that most of us have, we don't get the proper nourishment we need every day. AIM BarleyLife is our insurance that helps us maintain the fuel we know our body needs, and most importantly keeps our immune system strong. 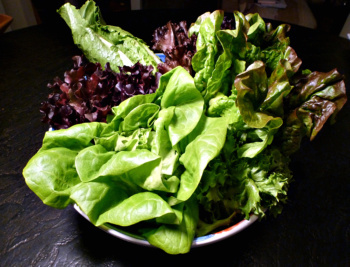 Phytonutrients - plant chemicals that are essential to health. The AIM Company harvests the young green barley plant in the cool of the night and it is immediately juiced. The live healthy juice is finally processed without any fiber remaining. The water is removed by a proprietary cold process that preserves the enzymes in the rich green powder. This is the uniqueness of BarleyLife. Enzymes are the protein structures that make things happen in an organized and controlled manner. When you add liquid to prepare to drink the juice, the enzymes are there just like fresh juice. Don't be fooled by most green powders in the market today. They are less costly since they are heat processed. This eliminates the health giving enzymes when exposed to the high heat dehydrating processes. Many producers also include the milled dried green leaves ground up to produce an inferior green powder. Enzyme rich BarleyLife powder and other live juices will play a major role in creating excellent health for us all. BarleyLife is nutrition that works! We are making it available on our website because we know this stuff is for real. If you have any questions, call Hal or Barbara at 813-260-2314 or email us at whybsic@gmail.com. We are authorized AIM distributors. To order AIM BarleyLife and receive a substantial discount, click here for the lowest pricing and secure checkout.